Abstract: “Dilly” an 11 year old quarter horse mare presented for acupuncture therapy for acute cervical muscle soreness and decreased cervical flexibility as the primary complaint. Her owner noted that her posture had changed while grazing and eating hay in her paddock. Dilly also had a history of chronic intermittent laminitis that the owner was also interested in treating. Dilly’s previous laminitis episodes lasted for about two weeks with conventional therapies which included soaking hooves in ice, daily phenylbutazone, and stall rest. Dilly was 5 days into another laminitis flare up at the time of her initial acupuncture evaluation. Her owner was hoping that acupuncture therapy would decrease the length of her laminitis episodes. 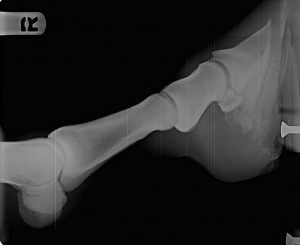 Previous radiographs from her regular veterinarian showed that she had mild chronic laminitic changes in both front feet. Dilly had marked improvement in cervical flexibility and moderate improvement in lameness after 3 once weekly acupuncture treatments. History and Presentation: “Dilly” an 11 year old quarter horse mare presented for acupuncture therapy on November 15th, 2017 for the primary complaint of cervical muscle soreness, decreased cervical flexibility, and a secondary complaint of chronic intermittent episodes of laminitis. Dilly had experienced 3 episodes of laminitis over the last 3 years. Those episodes were managed with daily administration of phenylbutazone, daily ice baths to her front feet and therapeutic shoeing. 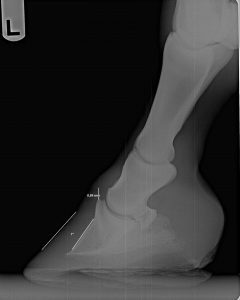 Dilly’s primary veterinarian obtained radiographs of both front feet to determine if her distal phalanx was rotating down as is the case for many horses with laminitis. Please refer to attached radiographs titled “Dilly X-Ray 000-0003”. The radiographs showed that Dilly had mild chronic laminitic changes between the hoof wall and dorsal cortical surface of the distal phalanx. These two surfaces should have been parallel with each other but instead there was a change of 7 degrees downward in the distal phalanx. (1) Dilly received regular farrier visits which kept her sole depth, toe length and heel height in the correct proportions. She was on a strict diet of grass hay with no pasture access to decrease the risk of additional laminitis episodes. Her owners most recent complaint was that she had acute onset of decreased flexibility in her neck laterally and decreased ability to extend her neck ventrally to eat her hay. Her owner provided videos showing the abnormal grazing posture. Normally horses will extend one foot directly in front to bear the weight of the head and neck as they come down to the ground. In the videos titled “Dilly Before Video 1 and 2”, it was evident that Dilly was not willing to extending either of her front feet forward and under her body, but instead she had her front limbs placed more laterally. She also raised her head upward from her hay pile several times in an irritated manner indicating that she was experiencing discomfort while reaching down for her meal. Physical Examination and Clinical Assessments: During Dilly’s initial physical exam, she was bright, alert and responsive (BAR), and had normal vital signs. Her neurologic exam was unremarkable. She had a grade 2 lameness bilaterally in her forelimbs. Mild effusion was noted around the coronary band of both front feet. Dilly did not have bounding digital pulses in her feet at this time. During her myofascial exam it was noted that she had decreased cervical flexibility laterally with less flexibility to the left compared to the right. The caudal cervical vertebra appeared to be the segments with decreased flexibility. She also had decreased ventral flexibility when asked to stretch downward. She had trigger points located in her triceps muscles bilaterally, brachiocephalicus muscles bilaterally, and extensor carpi radialis muscles bilaterally. Palpation of the spine revealed moderate lumbar reactivity at the level of L4-L6 vertebra. Palpation and manipulation of the poll and atlanto-axial region of the cranial neck did not reveal any sensitivity. Differential Diagnoses: Top differentials for Dilly’s decreased cervical flexibility included cervical compensatory pain from laminitis, cervical arthritis, cervical muscle strain, trauma, and cervical stenotic myelopathy being least likely. Top differentials for Dilly’s recurrent laminitis episodes included dietary dysregulation or an equine endocrine disorder such as Equine Metabolic Syndrome (EMS) or Equine Pars Pituitary Intermedia Dysfunction (PPID). Definitive or Putative Diagnoses: Cervical stenotic myelopathy was easily ruled out due to age, acute onset and normal neurological exam. Trauma was also ruled out as Dilly’s symptoms were slowly progressive and she had no other signs of trauma such as abrasions or lacerations. Exertion or muscle strain was also unlikely due to the fact that Dilly had not been ridden for several months before the onset of symptoms. Cervical radiography for vertebral evaluation was discussed with the owners. They declined because they wanted to see if her clinical signs would improve with acupuncture. 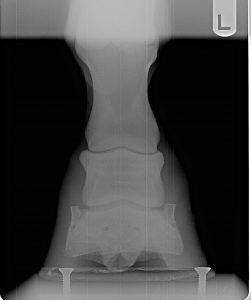 After reviewing previous radiographs, medical records and considering Dilly’s physical exam, the putative diagnosis for her cervical problems was cervical compensatory pain secondary to laminitis. Due to the fact that Dilly was a very well managed horse with a compliant owner, it seemed unlikely that her laminitis issues were due to an inappropriate diet high in starches, which is often implicated in the pathogenesis of laminitis. The putative diagnosis for her chronic laminitis issues were likely associated with equine endocrine disorders such as EMS or PPID. Laminitis is commonly reported as a concurrent problem in horses diagnosed with EMS and PPID. Although these diseases and diagnostic testing were discussed with Dilly’s owners, they elected to delay additional diagnostics. Acupuncture Treatment Points: Appointment 1: Large Intestine (LI) 10, 16, 17, 18: Small Intestine (SI) 9: Bladder (BL) 23, 24, 25, 26: Governor Vessel (GV) 4, 14: BaiHui, and Ting points LU 11, SI 1, TH1, and HT 9. Appointment 2: LI 10, 16: SI 9, BL 23, 24 25, 26: GV 4 14: Baihui: Ting points. Appointment 3: LI 16: BL 23, 24, 25, 26: GV 4, 14: Baihui. The needles used for Dilly’s first session were 0.20x30mm Seirin J type needles and 0.14x15mm Seirin needles for Ting points. Needling techniques used were dry needling only. Needles were placed for between 5-10 minutes. Medical Decision Making: The first few acupuncture points chosen for Dilly included Baihui, GV 4, GV 14 and LI 16. These beginning point were chosen to assess her reaction to needle placement. GV 4 was also indicated for her lumbar pain due to its stimulation of cranial lumbar spinal nerves and local muscle tissue. GV 14 was indicated for her neck pain and action on the cervicothoracic spinal nerves. Dilly was accepting of GV 14, GV 4 and Baihui. She was slightly reactive to LI 16. The primary treatment rationale was to attend to the cervical pain and rigidity. LI 17 was chosen due to its proximity to the caudal cervical spine, specifically C5 and C6. Its proximity to the brachiocephalicus and action on mid cervical spinal nerves also made it an ideal point. LI 18 was used due to its proximity to the brachiocephalicus muscle also. Dilly did not tolerate LI 17 or 18 at all and tried to strike out and bite when those points were attempted. They were not used in her subsequent appointments. The secondary treatment rationale was to treat the inflammation and pain associated with her current laminitis episode because Dilly’s cervical inflexibility could be correlated to compensation. Ting points including LU 11, SI 1, TH1, and HT 9 were chosen due to effects on the digital nerves and the fact that they stimulate the nervi- vasorum within the coronary band to increase blood flow to the foot (2). The third treatment rationale was to address compensatory muscle pain and taut bands which were present in the lumbar spine, triceps muscles and extensor carpi radialis muscles. SI 9 was used in the first two appointments to relieve the taut bands and tension in the triceps muscles bilaterally. During reevaluation at her 3rd appointment, her triceps muscles did not appear as taut and ridged as her prior appointments so SI 9 was not used. LI 10 was considered for her taut banding in the extensor carpi radialis but Dilly reared up when attempting to needle his point so it wasn’t used again at future appointments. Treatments for Dilly’s lumbar sensitivity included BL 23, 24, 25, and 26. Dilly was very accepting of these points and did not react when they were placed. Outcomes, Discussions, and References: Dilly had a moderate improvement in her lameness and she had marked improvement in cervical flexibility after 3 acupuncture therapy sessions. According to her owners, Dilly’s laminitis episode resolved faster than her previous laminitis episodes. Please see videos titled “Dilly After Video 1 and 2” which shows Dilly in normal grazing posture compared to previous videos. Although she was not accepting of some acupuncture points, she did respond well to the ones that were able to be used. Due to her more unpredictable responses, electrostimulation was not used during her treatments. One consideration that was taken from Dilly’s acupuncture case was that her negative reaction points LI 17, 18 and LU 10 could have due been to extreme muscle wind up in these regions. It may have been more advantageous to focus on the caudal aspect of her body and distal limbs in the beginning and then after a few session go back and address the tense cervical and forelimb regions. 1. Sherlock, C., and A. Parks. 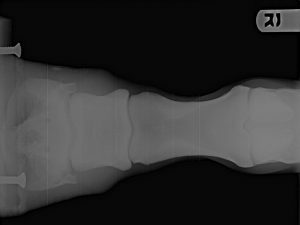 “Radiographic and Radiological Assessment of Laminitis.” Equine Veterinary Education, vol. 24, 2013, pp. 524–534., doi:10.1111/eve.12065. 2. Lancaster, Lisa S, and Robert M Bowker. “Acupuncture Points of the Horse’s Distal Thoracic Limb: A Neuroanatomic Approach to the Transposition of Traditional Points.” Animals, vol. 2, no. 3, 17 Sept. 2012, pp. 455–471., doi: 10.3390/ani2030455.